Our focus is to provide you with updated and accurate market price predictions for all of 2018, we believe we are entering a period that will be fantastic for traders and active investors. We believe this recent volatility has shaken out the low volatility expectations and will allow the markets to start moving in a more normal rotational mode going forward. This means we’ll have lots of trading opportunities to profit from. For those of you who have not been following our research over the past 2 to 3 months, we urge you to visit our Technical Traders Ltd.website to read our published research and to learn how we’ve been calling these moves in the markets for our members. We called the early 2018 market rally weeks before it started. We called the lower price rotation over a month before it happened. We called the bottom in this price correction almost to the day and told our members that we believed a very quick Pennant price formation was set up that will drive prices higher which we have seen this week. Members know price should move higher leading to a March 15 price cycle peak. After that point, we’ll refresh our analysis for our members and attempt to provide further guidance. Today/Friday we closed our Short position in UVXY for a quick 50% in 9 days. In this post, we are going to focus on one of our price modeling systems based on Adaptive Fibonacci Price Modeling and show you why we believe this recent price move will likely stabilize within a range while attempting future moves. Let’s start with the INDU. 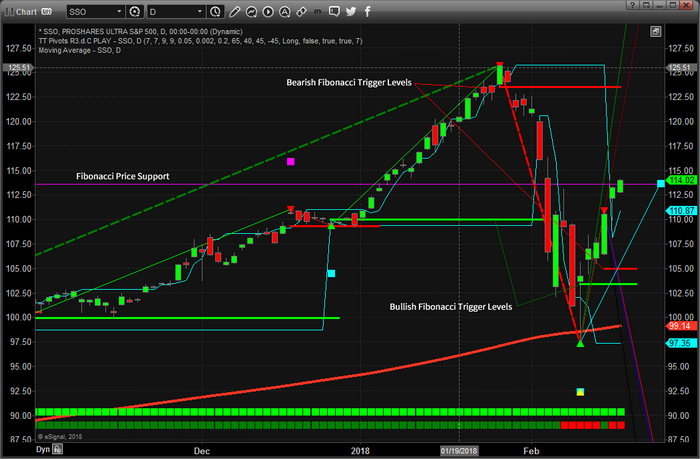 This first chart is the INDU Weekly chart with our Fibonacci Modeling system at work. We’ve highlighted certain areas with notes to help you understand it in more detail. This adaptive modeling system tracks price high and low points in various cycle lengths, then attempts to adapt a major and moderate cycle analysis model to key Fibonacci predictive points. The end result is that we can see where key Fibonacci price trigger levels are and also see what our predictive modeling system is telling us where prices is likely headed. This weekly, chart shows us that the current support level (originating from near April 2017) is nearly exactly where the current price correction found support. This level is currently acting as a strong base for current price action and will likely continue to provide very strong support going forward. You can also see the Bearish Fibonacci Price Level near 25,776 that is acting like Resistance. 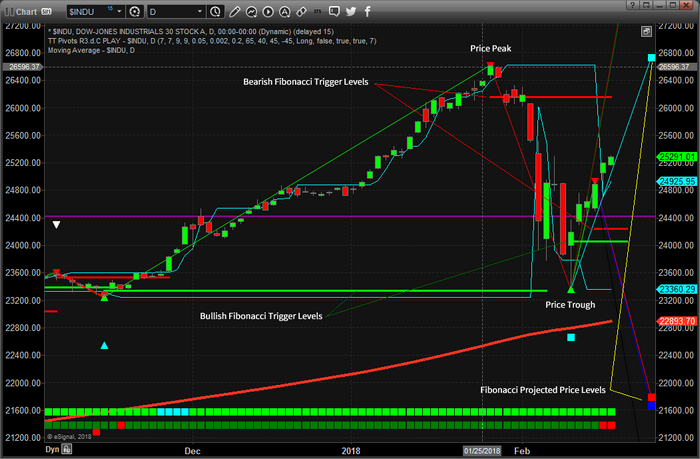 Notice that this Bearish Fibonacci Price Level also coincides with the BLUE Fibonacci projected price level. It is still our opinion that the US major markets will continue moderate price rotation within these levels for the next 5+ days before reaching an intermediate price low cycle near February 21. After this price low cycle is reached, we believe a new price advance will begin to drive the US majors higher reaching a peak near March 15. This next INDU Daily chart provides more detail of our projected analysis. Again, please read the notes we’ve made on this chart to assist you in understanding how we are reading it and interpreting it. The most recent price peak and trough clearly show the volatility spike that happened last week. It also shows us that the recent trough in price aligned almost perfectly with a Bullish Fibonacci Price Level from November 2017. We interpret this as a clear “double bottom” formation at Fibonacci Support. The purple horizontal line is the Support Level originating from the earlier, Weekly, chart for reference. This Daily chart shows more detail in terms of the Fibonacci Projected Price Levels and also shows the wide range of price that we are currently experiencing. Over time, this wide range will likely diminish a bit as the trend continues to consolidate price rotation into more narrow bands, but right now we have a very wide range of price volatility that we have to deal with. Additionally, the current upward price rotation is above the Bullish Fibonacci Price Level from the recent lows. This is a clear indication that prices want to continue to push higher till some new price peak is in place. We expect that will happen fairly soon. 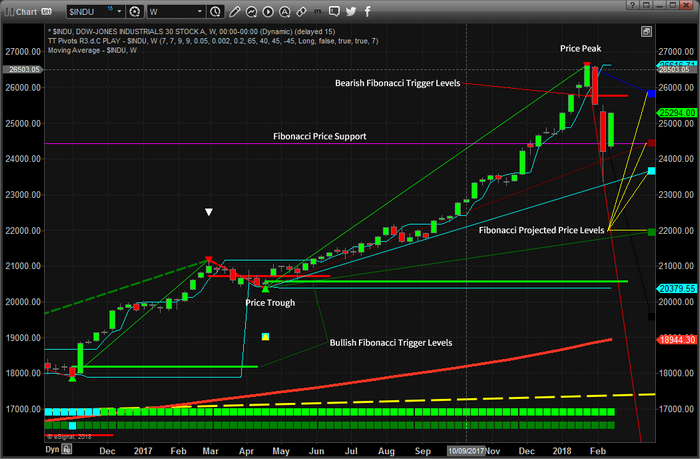 Notice how the Fibonacci Projected Price Levels are quite a way away from the current price levels? This is because the recent increase in volatility is alerting the price modeling system that we expect larger range price rotation. As newer and more moderate price rotations form, these levels will begin to consolidate a bit with new price levels. As of right now, our analysis has really not changed much since last week. We believe the Feb 21 price low will prompt a rally into the March 15 price peak. At that time, we’ll take a fresh look at these modeling systems to see what they can tell us about the future. The last chart I wanted to share with you is the Daily SSO chart. This chart helps to firm up our analysis of what to expect in the immediate future as well as continues to support our analysis that the US Majors will likely stall near current levels and retrace slightly headed into the Feb 21 price low. Remember, we don’t believe this Feb 21 price low will be anywhere close to the recent lows. This move lower will be much more subdued and moderate in size and scope. With this SSO chart, the Adaptive Fibonacci Price Modeling system is showing a potential “Major Bottom” near the recent lows. This happens when the system identifies a potentially massive or major price bottom. Over time, the modeling system will confirm this trigger or replace it with a new trigger when it forms. We still see the massive price volatility in this chart. We still see the Fibonacci Price Trigger Levels that tell us we are below the Bearish Price Trigger (near the recent top) and above the Bullish Price Trigger (near the recent bottom), so what should expect price to do? At this point, the most recent Price Trigger Breach is the Bullish Price Trigger – thus we are expecting prices to continue higher overall. The new Bearish Fibonacci Price Trigger, below the current prices, is what we would watch for any signs of price weakness. When that level is breached, then we begin a new potential down leg. Right now, we will issue this one simple warning – the upside move is likely to be ending soon and preparing for our February 21 price low point. The fact that prices are showing that they’ve already reached the Fibonacci Projected Price Level is telling us this upside leg may be over for now which is the reason we exited our short UVXY position here for a 50% profit. Next, we expect the US majors to rotate lower for a few days headed into a February 21 price low. This will be following by an almost immediate and strong upside push to a March 15th price peak. This means we will be setting up for some great trades over the next few days/weeks. Imagine being able to know that near February 20~22, we should be able to “pick” the best opportunities for quick trades where the US majors begin a new up leg? Also, imagine how critical this type of information can be to you going forward? Our research team at www.TheTechnicalTraders.com has a combined 53 years of trading and analysis experience. We develop specialized and proprietary price modeling systems, like these, to assist us in being able to provide our members with an “edge” in the markets. Of course, we are not always 100% accurate with our predictions – no one can be 100% accurate. We simply do our best to make sure our members get the best we can offer them each and every day. We want them to understand the opportunities that are playing out and we help them find the best trade triggers for profits each week. so be sure to join our free mailing list! If you find this information valuable and would like to include it in your daily trading activities, visit www.TheTechnicalTraders.com – Wealth Building Newsletter today!